But our attorney-general, hot on the heels of a national and global reaction and condemnation of the verdict, has warned all Malaysians that questioning and expressing concerns over the Appeal Court’s verdict dangerously hinges on contempt of court. The AG of Malaysia expects everyone to shut up, stay out and toe the line. No, this cannot be, for no citizen in pledging his unconditional patriotic duty and honour to God, Agong and nation should ever let this nation of people be divided, deprived, marginalised and become suspicious of each other’s faith matters. Truly, the ‘Allah’ issue is not going down well all across the nation, across right-minded Muslim and non-Muslims citizens, and certainly amongst learned and respected scholars from all religions across the world. Would the AG then be prepared to tell all these concerned and God-fearing people that they should accept the court’s verdict or otherwise suffer the ‘contempt of court’ consequences? Threatening of ugly backlashes by showcasing and permitting segments of protesters to demand for the exclusivity of the ‘Allah’ word is not going to make the world change its mind or believe the Umno story-line and support the court’s verdict. One thing for sure, humanity will not change its course after thousands of years of non-exclusivity over the use of the word ‘Allah’ just because of Malaysia’s Appeal Court. 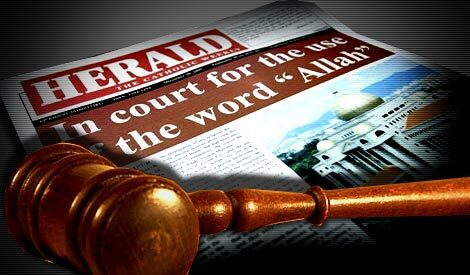 Already the public is of the opinion that this banning of the ‘Allah’ word – which the government claims is only for the Catholic publication’s The Herald and applies to the Bahasa Malaysia section of the weekly, is politically programmed. Hence it no surprise that Anwar Ibrahim, the leader of the opposition coalition, has issued a balanced and firm ‘no support’ for the ban unless if it can be established beyond all doubt that the intention by the published is malicious. Likewise, PAS – a theocratic political party that enjoys a respected reputation amongst Muslim scholars and countries globally, has stated without hesitation that the word ‘Allah’ does not belong exclusively to Malaysian Muslims. This then leaves behind a pointer at Umno and that it has politicised religion for its own gains. And now for the AG to display his clout, cautioning citizens with the ‘contempt of court’ reminder and warning all to heed by the court ruling further makes the public wonder if Umno and the Judiciary are in cohorts. It certainly looks very clear that somewhere along the political journey in Malaysia, we have messed it all up real big time. And so each wrong is taking a bigger wrong to cover the trails. For how long we will be able to travel this ill-advised path is yet to be seen. But in the best interest of human civilisation and its progress, all right-minded Muslims who proclaim the beauty of Islam to the world must rise to the occasion; likewise all non-Muslims; so too all professionals and especially those who uphold the legal profession; and academics – everyone must join hands now to rationally and peacefully correct what is not right for all of us and even in the entire world of believers, both Muslims and non-Muslims. In this ‘Allah’ issue, threats, warnings and high-handed dealings as well as street protests and battle cries are not the civilized way forward to resolve. It calls for leadership. It demands wisdom. Above all, we must stand virtuous before the Almighty Creator – the one God who made us all humans and all things around us. ‘Allah’ is beyond politics. It is beyond the law of humans. No human can be conditioned, threatened, warned, deprived, robbed or denied the right, freedom and honour to urge the Almighty as is known since the dawn of human history and recorded truth. AG, please facilitate wisdom to prevail. Umno, please enable the beauty of Islam to blossom. Malaysians, let us see to regaining the world’s respect for us. In His Name we – Muslims and non-Muslims do trust and therefore no man or woman can take that away from all of us, Muslims and non-Muslims alike. IN MALAYSIA THE WORD “ALLAH’ HAS TAKEN A WHOLE NEW MEANING AFTER THE APPELLATE COURT OF APPEAL’S MORONIC RULING. TO ME, THE WORD IS SYNONYMOUS WITH INJUSTICE, FEAR, BULLYING, HYPOCRISY AND ABOVE ALL PURE STUPIDITY. THE AG WHO COMPLETED A THIRD-CLASS LAW DEGREE IS ACTING LIKE A GANGSTER BY ISSUING THAT THREAT!!! Who is going to heed this despicable AG ‘s warning? The most corrupt, dirtiest and rotten AG the world has even known.